There was nothing particularly noteworthy about the village of Olwynion. It had once been well-known for its wheelwrights, but that was so long ago that few now remembered. Apart from that one nearly-forgotten fact, nothing in the history of the village would be of interest to a writer or an historian. The village lay cradled by mountains in a small valley on the Isle of the Moon. There was a small river, and about a mile to the south there was a lake where children went to swim in the summer. Most of the villagers were farmers or shepherds; there was a slightly mad poet who lived on the hill, but many villages have such poets. Life in Olwynion was quiet, but not without its pleasures. The seasons were gentle; the mountains protected the valley from the cold winds of winter. Farming was hard work, but the soil was rich and the crops were good. Some longed to leave, thirsting for risk and adventure, for a life that contained more than just the village and the seasons. Some left. Some did not. Many, but not all, eventually returned. It’s hard to forget the hills and forests of one’s childhood, no matter how hard one tries. Those who stayed rarely cared about politics and the issues of the world outside the valley. There were fields to attend to, marriages to be planned, legends to be told to grandchildren sitting by the fire. There was life: real life, village life. Who could possibly care about foreigners waffling on and on about systems of trade and other such nonsense? Then, one day, the villagers heard that Olwynion was in debt. They didn’t know what this meant; it’s not like they had borrowed anything. So they dismissed it as yet more foreign nonsense. Not much later, people started arriving in Olwynion. Stern, stuck-up people who tsk-tsked at the smelly villagers and talked down their noses at them. They berated the farmers for their inability to cut spending. Irritated, the farmers pointed out that they didn’t owe anyone anything, but the snooty foreigners disagreed. More people started coming, some of them soldiers. Orders were given to change the ways of the village. Modernization, they called it. The villagers didn’t think it made much sense, but they’d never been in a situation like this before. Soldiers in Olwynion? Next thing there’d be a dragon! And anyway, they were just farmers. Maybe the snooty foreigners with their magic words and their arcane numbers knew something that the people of Olwynion did not. Slowly but surely, life in the village became impossible. Before long there were no more marriages to plan, or grandchildren to tell stories to. People started moving away, abandoning the fields their families had worked for generations. The tsk-tsking people predicted that the fall in unemployment caused by the exodus would reinvigorate the village, but somehow this did not come to pass. 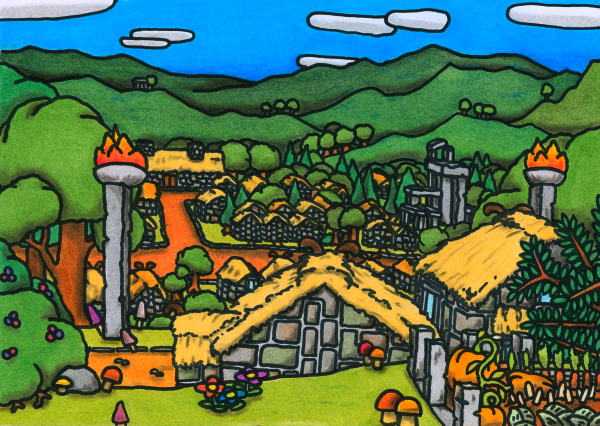 Within less than a year, the village was empty. Just like that, from one season to the next, without any real warning, the life of Olwynion was drained away. If the story ended here, it would be one to cause nothing but despair. But remember: the hills and forests of one’s childhood are not easily forgotten. And so the people of Olwynion, the wheelwrights’ village, spread across the Isle of the Moon, and wherever they went a little bit of the village went with them. And thus they brought to their new homes something special that had been born in that once-unremarkable village, something that was the first step towards freedom: doubt. This entry in the Oneiropolis Compendium was made possible by Andrew McCoy, director of the Trans-Allegheny Lunatic Asylum.